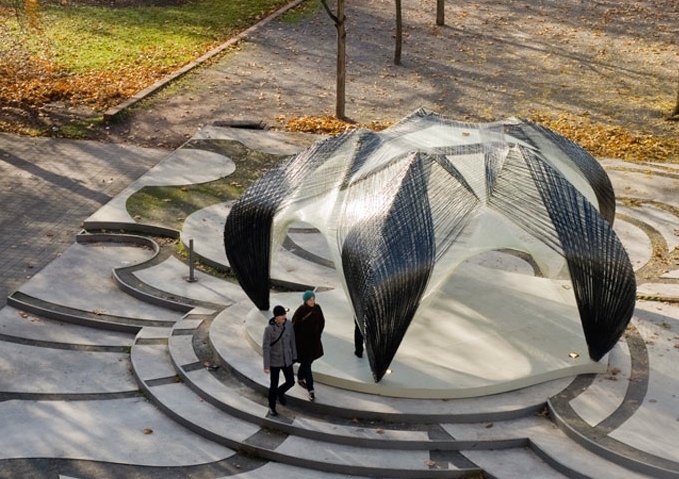 Back in late 2012 the Institute for Computational Design and the Institute of Building Structures and Structural Design at the University of Stuttgart completed a research pavilion that is entirely robotically fabricated from carbon and glass fibre composites. 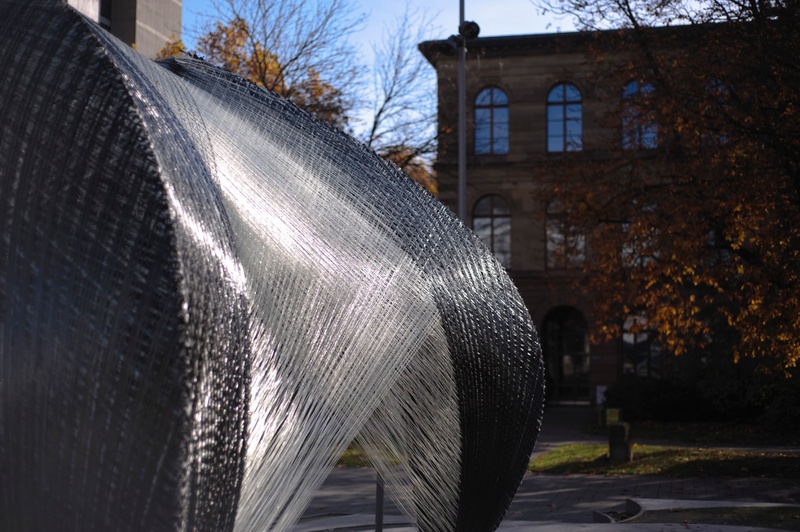 The project was undertaken by architectural and engineering researchers of both institutes together with students of the faculty and in collaboration with biologists of the University of Tübingen, investigates the possible interrelation between biomimetic design strategies and novel processes of robotic production. The research focused on the material and morphological principles of arthropods’ exoskeletons as a source of exploration for a new composite construction paradigm in architecture. At the core of the project is the development of an innovative robotic fabrication process within the context of the building industry based on the filament winding of carbon and glass fibres and the related design tools and simulation methods. 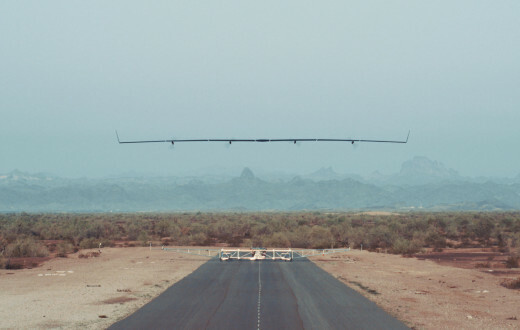 A key aspect of the project was to transfer the fibrous morphology of the biological role model to fibre-reinforced composite materials, the anisotropy of which was integrated from the start into the computer-based design and simulation processes. 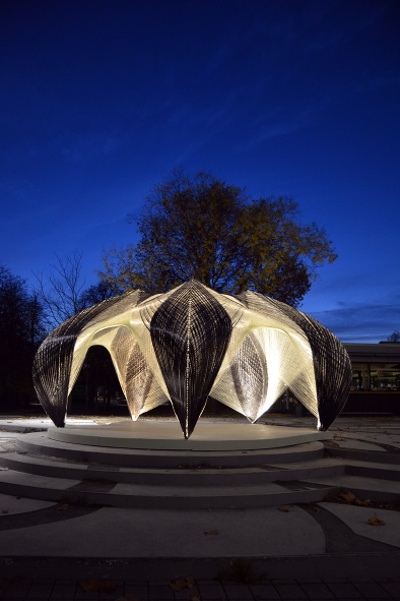 The computer simulations and robotic manufacturing, specifically allowed for the development of a high performance structure: the pavilion requires only a shell thickness of four millimetres of composite laminate while spanning eight metres. 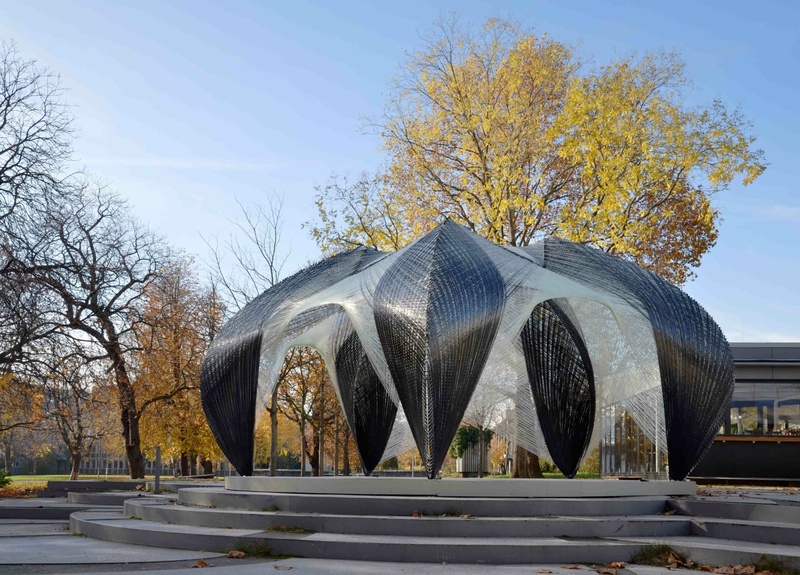 The development of the Pavilion focused on the material and morphological principles of arthropods’ exoskeletons as a source of exploration for new construction compounds in architecture. The lobster’s exoskeleton (the cuticle) consists of a soft part, the endocuticle, and a relatively hard layer, the exocuticle. The cuticle is a secretion product in which chitin fibrils are embedded in a protein matrix. The specific differentiation of the position and orientation of the fibres and related material properties respond to specific local requirements. The chitin fibres are incorporated in the matrix by forming individual unidirectional layers. In the areas where a non-directional load transfer is required, such individual layers are laminated together in a spiral (helicoidal) arrangement. The resulting isotropic fibre structure allows a uniform load distribution in every direction. On the other hand, areas which are subject to directional stress distributions exhibit a unidirectional layer structure, displaying an anisotropic fibre assembly which is optimised for a directed load transfer. 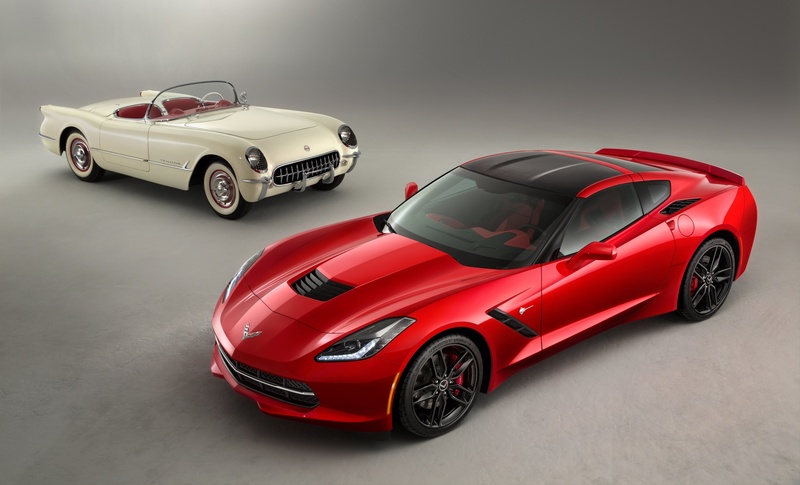 Due to this material difference, the shell creates a highly adapted and efficient structure. In collaboration with the biologists, the fibre orientation, fibre arrangement and associated layer thickness and stiffness gradients in the exoskeleton of the lobster were carefully investigated. The high-efficiency and functional variation of the cuticle is due to a specific combination of exoskeletal form, fibre orientation and matrix. These principles were applied to the design of a robotically fabricated shell structure based on a fibre composite system in which the resin-saturated glass and carbon fibres were continuously laid by a robot, resulting in a compounded structure with custom fibre orientation. In existing fibre placement techniques, e.g. in the aero-space industry or advanced sail production, the fibres are typically laid on a separately manufactured positive mold. Since the construction of a complete positive formwork is fairly unsuitable for the building industry, the project aimed to reduce the positive form to a minimum. [one_half_last]As a consequence, the fibres were laid on a temporary lightweight, linear steel frame with defined anchor points between which the fibres were tensioned. Six different filament winding sequences control the variation of the fibre layering and the fibre orientation of the individual layers at each point of the shell. They are designed to minimising material consumption whilst maximising the stiffness of the structure, resulting in significant material efficiency and a very lightweight structure. The glass fibres are mainly used as a spatial partitioning element and serve as the formwork for the following layers, whilst the stiffer carbon fibres contribute primarily to the load transfer and the global stiffness of the system. 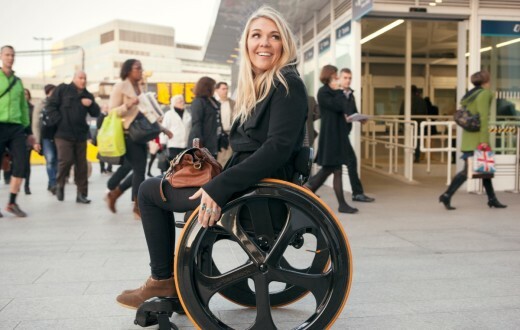 In addition to the structural carbon fibres for the load transfer and the glass fibres for the spatial articulation, functional fibres for illumination and structural monitoring can be integrated in the system. A prerequisite for the design, development and realisation of the project was a closed, digital information chain linking the project’s model, finite element simulations, material testing and robot control. Form finding, material and structural design were directly integrated in the design process, whereby the complex interaction of form, material, structure and fabrication technology could be used as an integral aspect of the biomimetic design methodology. The direct coupling of geometry and finite element simulations into computational models allowed the generation and comparative analysis of numerous variations. 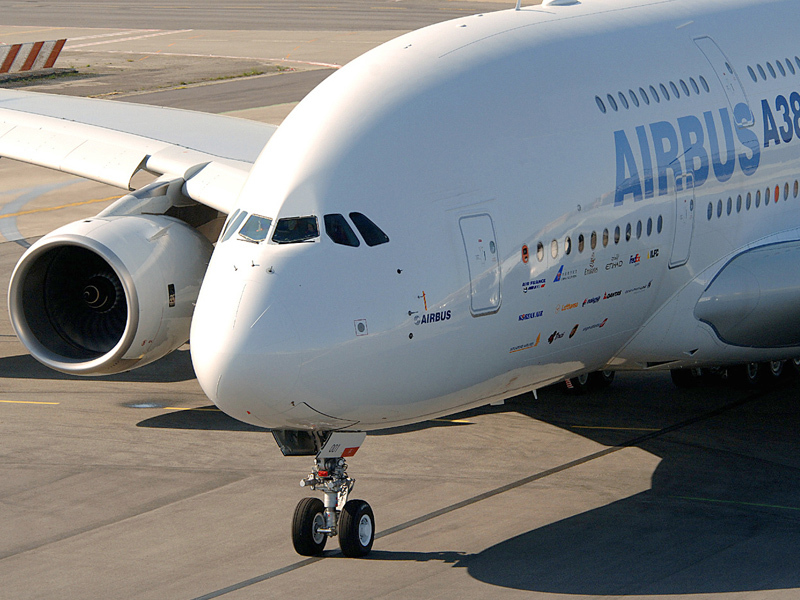 In parallel, the mechanical properties of the fibre composites determined by material testing were included in the process of form generation and material optimisation. 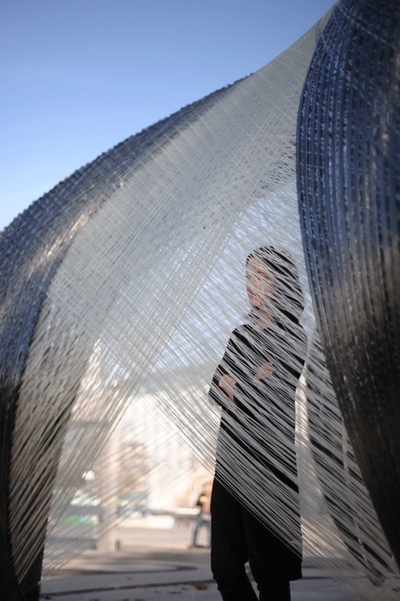 The optimisation of the fibre and layer arrangement through a gradient-based method, allowed the development of a highly efficient structure with minimal use of material. 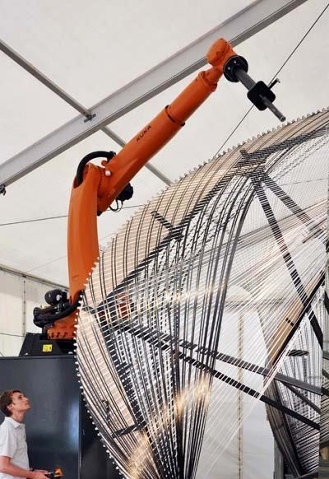 The robotic fabrication of the research pavilion was performed on-site in a purpose-built, weatherproof manufacturing environment by a 6-axis robot coupled with an external seventh axis. Placed on a 2m high pedestal and reaching an overall working span and height of 4m, the robot placed the fibres on the temporary steel frame, which was actuated in a circular movement by the robotically controlled turntable. As part of the fabrication process the fibres were saturated with resin while running through a resin bath directly prior to the robotic placement. 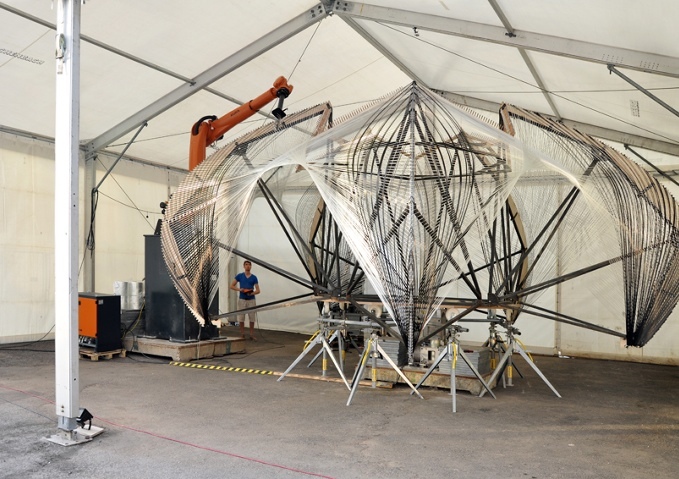 This specific setup made it possible to achieve a structure of approximately 8.0m in diameter and 3.5m height by continuously winding more than 60 kilometres of fibre rovings. The parametric definition of the winding motion paths in relation to the digital geometry model, the robotic motion planning including mathematical coupling with the external axis, as well as the generation of robot control code itself could be implemented in a custom-developed design and manufacturing integrated environment. 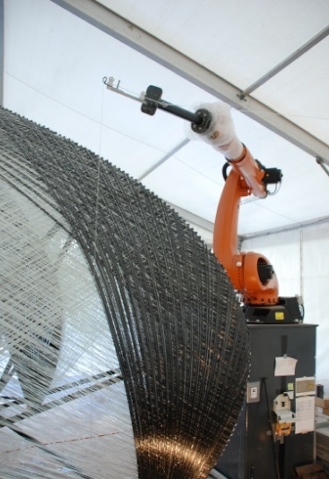 After completion of the robotic filament winding process and the subsequent tempering of the fibre-resin composite, the temporary steel frame could be disassembled and removed. The remaining, extremely thin shell of just 4mm thickness constitutes an automatically fabricated, but locally differentiated structure. 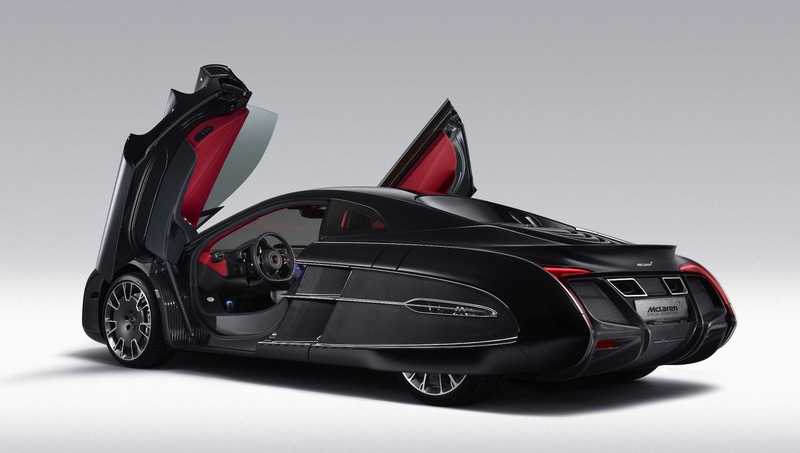 The integration of the biomimetic principles of the lobster’s cuticle and the logics of the newly developed robotic carbon and glass fibre filament winding within the computer design process enables a high level of structural performance. Despite its considerable size and span, the semi-transparent skin of the pavilion weighs less than 320kg and reveals the system’s structural logic through the spatial arrangement of the carbon and glass fibres.